Q: Can any amplifier be used for tactile transducers? A: In theory any amplifier with sufficient power can be used to drive the tactile transducers. In practice it requires several factors to be just right for it to work optimally. You need an adjustable low pass filter so you can filter out unwanted frequencies, typically you want to set a tactile crossover to allow frequencies below 60hz many prefer to go as low as 40hz. You want an amplifier that has enough power, but not immense power unless you have a voltage limiter in place along with a subsonic filter or a variable voltage filter. If the amplifier is of a sensible power level, you want to make sure it has a graceful overload characteristics (ideally cycle by cycle current limiting) so that in case of overdrive the tactile is not exposed to square waves. 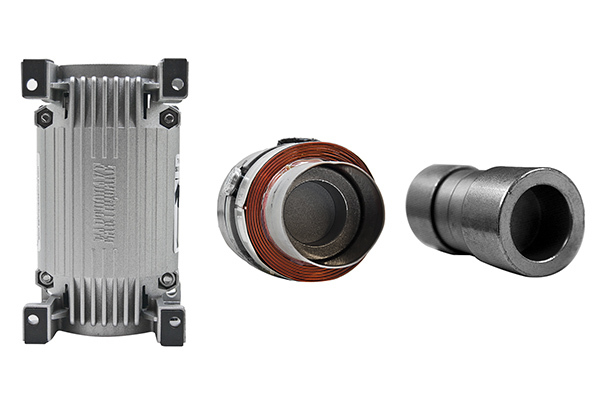 The XJ 300 and 700 amplifiers from Earthquake are ideal to power tactile transducers as they incorporate all the drive characteristics optimal for tactile transducers and crossover control is a simple one dial knob. Q: Can I use cheap pro amplifiers to drive Earthquake Q10b tactile transducers? A: In theory Earthquake tactile transducers can be used with any brand of amplifier. What makes our Xj700 ideal for the Q10b is that all its attributes are perfectly matched to the requirements of this transducer, meaning enough clean power to drive it fully, but not enough to burn it. It has a variable crossover that allows it to be tuned precisely to integrate with whatever subwoofer solution is used in conjunction to the tactile setup. It also features a precise decibel relative digital volume control for easy and accurate level matching. It is designed using a large toroidal transformer and discrete (real) transistors- tactile transducers require large and instantaneous amounts of current, cheaper pro amps based on chips and Smps instead of discrete transistors and transformers can lack the raw current capability required for optimal drive. Q: Can I install / mount the shaker horizontally? A: The MQB-1 and Q10B can only be installed in Vertical. On the Q10B you can see a label with an arrow on it. Q: Even though the Q10B states it has an impedance of 8 Ohm , why does mine show a different value? A: Impedance does not mean resistance. Impedance is the term used for resistance that varies with frequency. In other words impedance is not a fixed value. The stated 8 Ohm impedance is a targeted average that it will stay around during the majority of its operating range, both with regards to frequency and amplitude. When you measure it with a meter you are measuring the coils DC resistance. As soon as you apply an actual signal to the device the coil starts moving, thus generating EMF and using energy. This movement brings the impedance up from the static DC resistance of the coil itself. Q: My tactile transducer does not perform as expected ? A: There are two types of exiters/bass shakers. There is the piston based tactile transducer like we make. And there are the coil based vibrators. The Piston based types are ideal at high power low frequency output and can really move things physically, however they are not able to work at higher frequencies due to the weight of the moving mass. The coil based vibrators can make a lot of buzzing at higher frequencies, but cant really shake anything at lower frequencies due to limited power and moving mass. The MQB1 should not be crossed over higher than 80hz. Its linear operating field is up to 50, it will operate fine up to 80 but from 50 and up it starts going out of phase with the signal. The signal is faster than the device. If you are setting it at 120 then a lot of energy is being dissipated in the device since it can not be turned into movement effectively. 1. the signal source does not contain the proper low frequency content to make the transducer work. You must look at the signal with a spectrum analyzer and verify that it has ample content of sub 50hz content. b. too well terminated to ground. It is important that the tactile transducers only be used in true vertical position. If they are mounted on the standard or PB1 Bracket it can easily result in some sideways motion, especially if the mounting place for the bracket is not absolutely rigid. Using the bracket puts enormous torsional forces on the mounting spot, and even modest movement can result in the piston hitting the inside of the cylinder of the Q10B resulting in a clunking sound. If this can not be remedied by further fastening down the bracket, it is best to remove the bracket and mount the tactile transducer directly to the surface of the object being shaken. This will eliminate the horizontally directed torsional forces and remove any clunking sound. Q: What are the best settings and amplifier for my tactile unit? A: We recommend that you have roll off or high pass at 20 Hz or a brick wall filter at 15 Hz on tactile transducers. A tactile will indeed respond to frequencies below 5 Hz, but the amplitude it can play back at those frequencies is very low. It simply runs out of stroke. Every time you go down one octave in frequency, it requires 4 times more stroke to keep the same amplitude, as frequencies below 15 Hz will only be reproduced in very low levels - typically not enough to be seen as powerful. We would recommend our XJ-700R amplifier for tactile operations - it is made specifically for this purpose and is great for it. It has the adjustment possibilities required to ensure optimum operation of the tactile. Q: Can I mount two or more shakers? A: It is possible to mount two or more shakers. Hardly any signal sources have any stereo content below 80 HZ, so setting them up in stereo for regular music and movie playback would be inefficient. Also the LFE channel in movies is a monaural channel, so there is no stereo signal to begin with. If you are using it in a special effects capacity (e.g. a theme park or museum) a stereo effect might be usable depending on the setup, but it is too specific to give any general advice about. Any amp can in principle be used to power them, however it is important that the amp has very high damping so it can accurately control the tactiles, as they are moving a heavy mass and have massive EMF. Earthquake amps are uniquely suited to drive the tactiles because of phase and crossover being build in, along with variable gain. With an XJ amp from Earthquake you have everything you need for the optimal implementation in one box. If using a standard stereo amp you would need separate electronic crossover and phase adjustment. Q: Do you have a frequency response graph for the tactile transducers? A: Frequency response is not as easily measured in tactile transducers as it is in dynamic speakers, as the response from a transducer such as the MQB-1 is kinetic force and not sound pressure. Tactile transducers do not roll off in the traditional sense - in frequencies below 15 Hz, it will just use up its available piston travel at a much lower amplitude than it would at higher frequencies. So if you want to drive it to max excursion into low frequencies you should use a frequency adjustable voltage limiter to avoid bottoming out the transducer. If you are interested in reproducing ultra low frequencies the Q10B transducer has a much longer stroke and will be able to output more into the lowest of frequencies. Q: Can three MQB-1 MiniQuake match one Q10B? A: In terms of kinetic energy three MiniQuakes will be close to one Q10B . If the individual seats are isolated so vibration does not travel well between them, then a mini at each desired focal point is optimal. If the design allows for vibration to freely travel without a strong ground termination, we would recommend a single Q10b. Q: What frequency range does the Q10b support? A: The actual frequency response is 1 to 80HZ above 80 HZ the piston moves slightly out of phase with the signal proportionally increasing up to about 150HZ. Beyond 150 the majority of the signal energy is converted to heat. We recommend that the unit should not be used at high power at frequencies above 120 HZ. We have altered the specifications over time to best reflect the usage that will give optimum results in the typical home cinema environment. For special industrial and military applications it can be used to its full bandwidth and power capability. Q: What type of amplifier should I use to run tactiles at ultra low frequencies (15Hz and lower)? A: To run the tactile at ultra low frequencies an old school "Heavy Iron" Class AB amplifier should be used, as switching output amplifiers (Class D and derivatives) are not designed to operate at those frequencies as they come too close to DC for comfort and they usually have a high pass filter or modulator limiter build in to prevent passing of super low signals. For all actual audio uses such as music, home theater and gaming - an Earthquake XJ-300ST or XJ-700R is the optimal amplifier to use. They have superior control of the piston movement due to high emf absorption and high current capability unique to the class J output stage. Q: What are the differences between Buttkicker and Earthquake tactiles? A: The main differences between Buttkicker and Earthquake are weight of piston, length of travel and that Earthquake uses electromagnetic instead of kinetic braking of the piston. A Lentz center coil prevents the piston from over-excursion so you have a graceful overdrive characteristic with no obtrusive sounds. Whereas Buttkicker uses rubber bumpers inside the cylinder so at overdrive you hear a loud clapping sound. Buttkicker uses a very heavy piston 1.48 kg, which will give incredible amount of rumble, but the BL (motor strength) is nowhere near sufficient to keep the piston in phase with the signal . If you look at heavy duty 18 inch industrial subwoofers, they have magnetic/coil structures double the size of the buttkicker and they only have to control 400 grams or less. The Buttkicker has a piston travel potential of 1.5cm which greatly limits its linearity. The Q10B has a 500gram piston that it can move in phase up to 80hz with a travel of 5 cm. In general the Buttkicker will give you a lot of rumble with less control and the Q10B will give you very high percussive power with a linear output into the infrasonic. It will feel very precise and it will augment the low end in an integrated way. The Buttkicker will feel somewhat more separate from the subwoofer because it can not keep in phase with the signal. Which is best depends somewhat on what you want out of it. Q: How many Q10B do you recommend in order to get a really precise and profound shaking experience? I am very demanding on that experience, that's why I am looking for an alternative to ButtKicker LFE. Q: For such an experience on my platform, do you recommend mounting the Quake Q10B on a PB-1 amplification bracket? Or do I get a more precise and stronger response by mounting them directly to the platform? A: These two factors are somewhat inversely proportional. You will get a stronger response by using the PB-1 since it ads leverage. Archimedes said that he could lift the world if you gave him a lever long enough and a fulcrum. This is true here as well but at the expense of adding circular motion since the fulcrum would be the mounting point of the PB-1 to your platform. This will add a lot of energy, but it will lower accuracy and as mentioned add centrifugal force rather than the straight vertical energizing of a transducer mounted flat on you platform. One could argue that unless the tactile is mounted center of the platform you will experience some circular artifacts from the vertical energizing. The power transferred though the pb-1 is so powerful that if there is just the slightest give in the mounting surface of your platform or the mounting point then the centrifugal force can get high enough so that the piston will be knocked out of its magnetic levitation field inside the cylinder and hit the cylinder wall. This will produce obtrusive sounds. Q: I drive my two BK LFE with a ButtKicker amplifier BKA 1000-4. Presently, I use only about 1/3 of the amplifiers power in order to avoid bottom-out of the transducers. Is this amplifier also suitable to drive one or more Quake Q10B? A: Power wise they should have enough power, for most material, but if you are playing very dynamic source material at a high drive level they might run out of drive voltage, since our Q10b (never versions) are 8 ohm. Since the amp is rated for 2 ohm drive it should be able to run 3 Q10b transducers. "Q: What are the best settings and amplifier for my tactile unit?" it is stated "A: We recommend that you have roll off or high pass at 20 Hz or a brick wall filter at 15 Hz on tactile transducers." I want such a tactile transducer to reproduce those frequencies my subwoofer cannot reproduce faithfully any more (and I already have a subwoofer that is very very capable). Earthquake specifies the Q10B to go as low as 5 Hz, but do I have to expect almost no response at those low freqencies because the Q10B is not designed for that range? A: This has to do with physics. The q10b will output more power linearly into the lowest frequencies than any other transducer on the market, simply because we have the longest travel by a factor of 3 or more (and move a good amount of weight not to forget. But not much usable energy is at those low frequencies if you look at it from a sinusoidal point. You can easily hold the transducers in the hand while driving it to xmax at 3 hz, but drive it to xmax at 22hz and you can break though a concrete wall if you put it on a chisel. So as far as response it will react to and faithfully reproduce 0.5 HZ all day long. But to get he most usable energy out of it you want to make sure that you can drive usable frequencies at the highest possible amplitude (level) into it, without risking overload at infrasonic frequencies. A 40 hz signal will not use up the transducers xmax at a given voltage, but the same voltage (amplitude) might very well use up the xmax at 10hz. So one could either set the whole system on a voltage limiter that would allow maximum excursion without overdrive at 5 hz, but that would result in almost no kinetic energy in the higher frequencies. Or one can apply a filter that prevents the ultra low signals from over-driving the unit. Most importantly for the felt effect of explosions etc in moves is that the transducer has a long travel and is accurate as that will give the best sensation. The longer the travel the more each nuance of the material can be realized, with only say 1 cm of travel very little nuance is possible as it operates in overdrive almost all the time whenever the frequency is below 35hz. Your buttkicker amp is limited at the modulator to 15 HZ (like most class d amps) so you should not have a problem. Only high end class ab amp can typically reproduce frequencies below 15. Q: In the FAQ "Every time you go down one octave in frequency, it requires 4 times more stroke to keep the same amplitude," I think it is rather a matter of weight (of the piston) times velocity (of the piston) that decides on the force output of the transducer. Now the Q10B piston is lighter than the BK LFE piston, but has more stroke (= higher velocity at the same frequency). What about the force (= impact) at those low frequencies compared to the BK LFE? A: Amplitude here is voltage as the frequency decreases more stroke will be produced from the same amplitude. The power of a transducer is a combination of Weight, velocity and travel distance as travel distance relates to the frequency response and amplitude capability of the transducer. But several other factors play a big role for the qualitative output. Biggest being the transducers ability to accelerate and de-accelerate the piston accurately in phase with the signal. When the signal changes the Q10b snaps with it so lets say a cannon is fired in the movie the q10b will hit you very hard very fast and then be silent the second the signal stops . The buttkicker will give you a thumb that will linger. If the signal stops the Q10B will stop like it hit a concrete barrier, whereas the buttkicker will stop as if it was caught in a net or hit soft foam. It is force / energy released at the time of the signal that truly matters. So for a cannon shot the q10b will depart all its energy in a split second. The buttkicker will depart more energy, assuming they are both operating within travel xmax, but since the heavy piston does not start or stop right away that energy is released over a much longer time-period, basically until the motor can bring the piston to a stop. Years back we did some tests with sending squarewaves and triangle waves into the transducers and the kinetic energy departed from the one Q10B from a single cycle square wave measured no more than 20 degrees offset to the signal was equivalent to 5 Buttkicker LFE units.